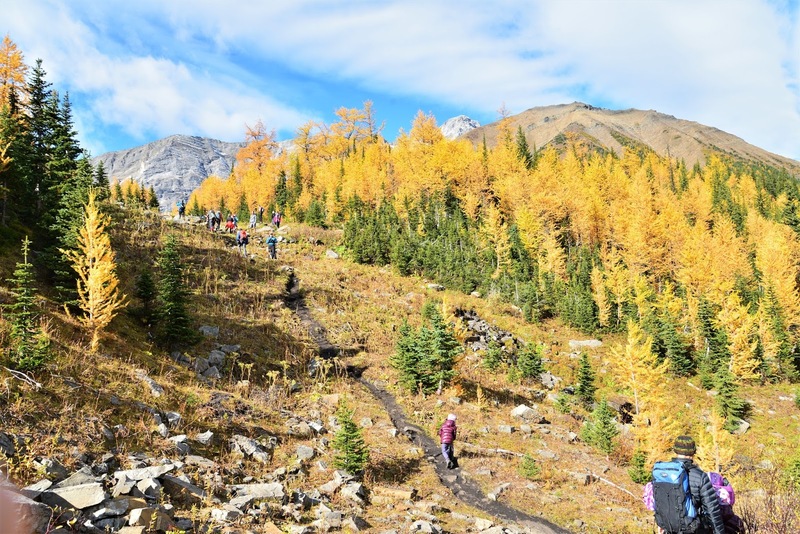 It's a glorious mid-September day and Pocaterra Ridge trail is full of hikers. We share a common goal: to see golden larch trees. 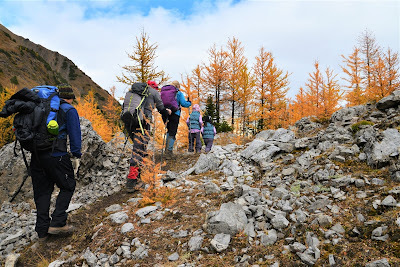 In short order, we will be rewarded with not only amazing larches, but a cirque, tarn, and stunning ridge walk. 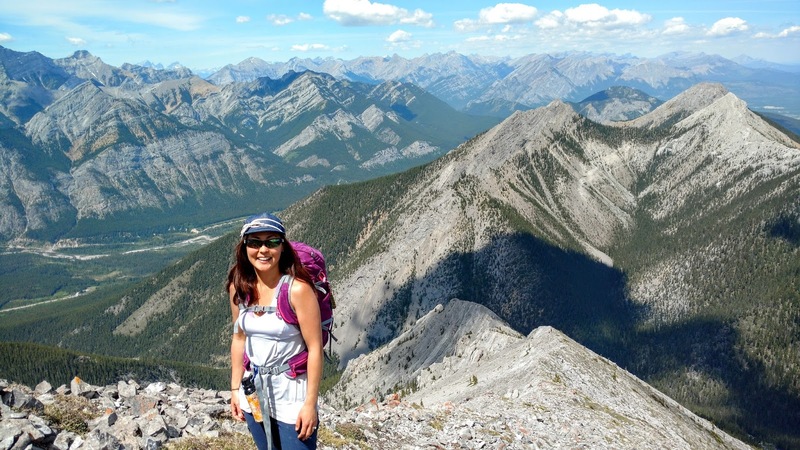 If you don't have time to complete the ridge walk, the first summit is a scenic stopping point. Even Pocaterra Cirque, 2.5 km from the parking lot, gets you into larch country! 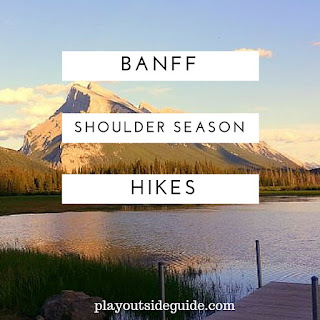 Return the way you came, or complete the ridge walk (car shuttle recommended), as time and energy allow. 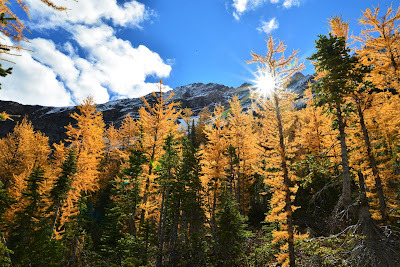 What's the big deal with larches? 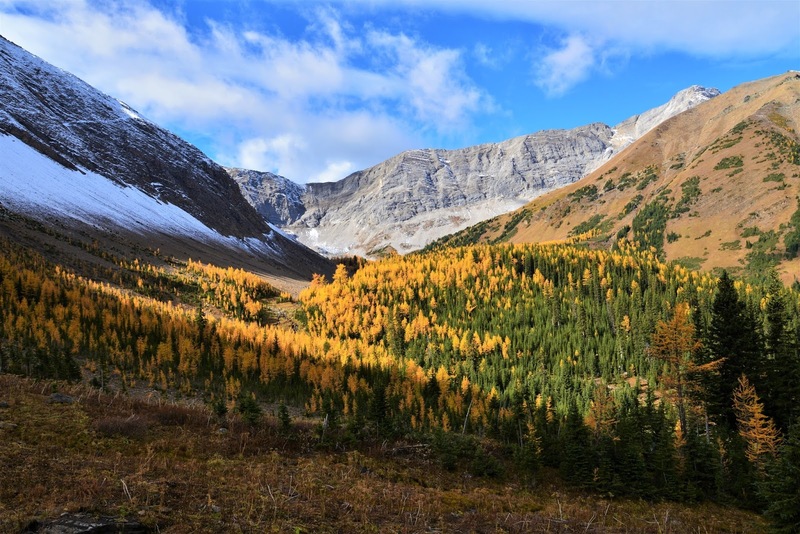 Alpine larches, aka Larix lyalli, grow only at high elevations (above 1800 m) and have soft, green needles that turn a vibrant shade of yellow for a few weeks each autumn. The spectacle is dramatic, but fleeting, so you have to time it right. 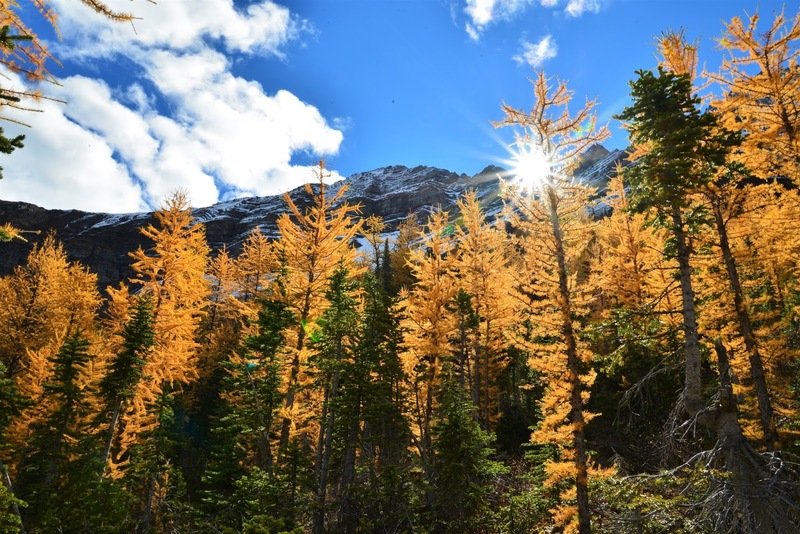 The second and third weeks of September are usually prime larch hiking season. While Lake Louise is famous for its larches, Kananaskis also boasts several great larch hikes, including Pocaterra Cirque and Pocaterra Ridge. 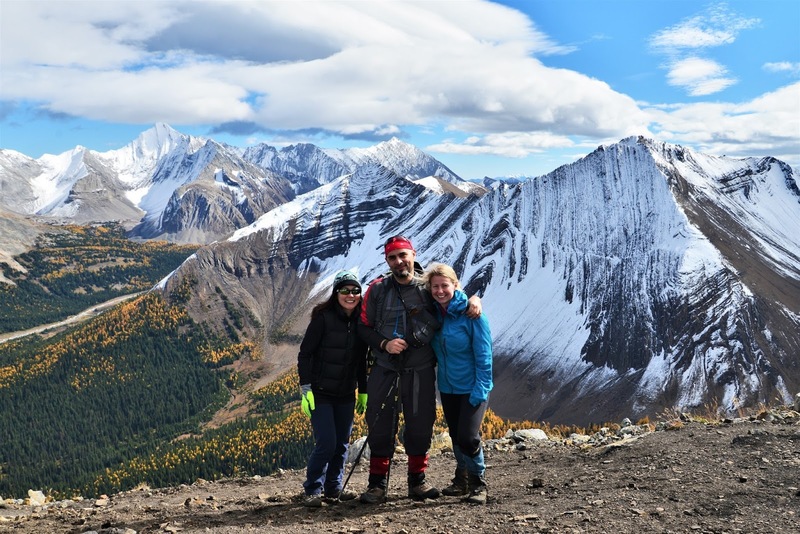 From Highwood Meadows Trail, after 200 metres we cross a little bridge and arrive at the turnoff to Pocaterra Ridge (on your left). We follow the narrow trail through the meadow, then head left into the woods. The trail is heavily shaded and the trees are laden with Old Man's Beard. 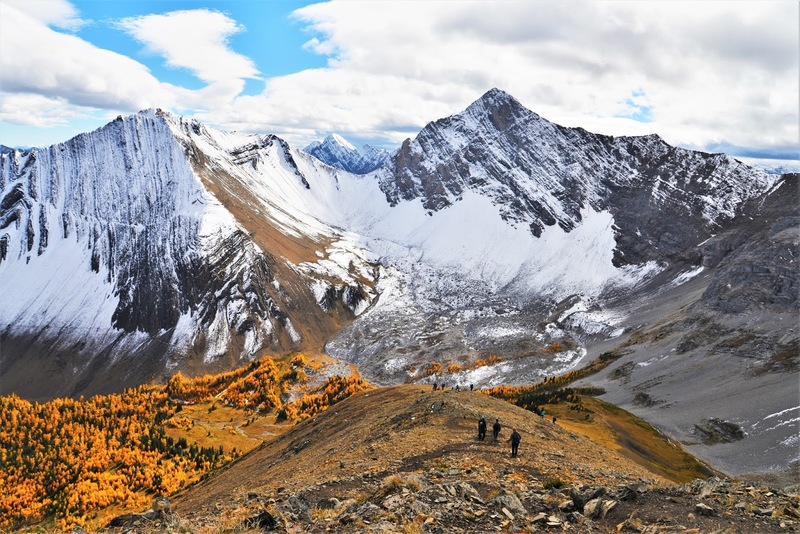 Pocaterra Cirque is at centre and Pocaterra Ridge is the brown slope on the right. 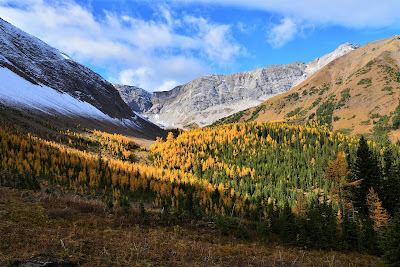 As we gain elevation, the views begin to open up, and soon we are where the larches are. Sunlight sparkles on snowy peaks overlooking the valley and boulders ask to be climbed. 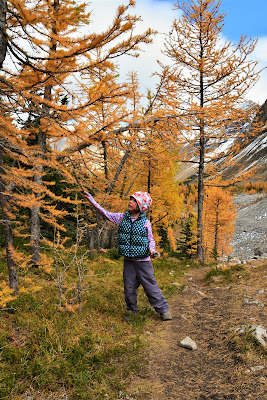 A little tarn (2.1 km from parking, 200 m elevation gain) surrounded by larches makes a nice snack spot. The kids decide to hang back and play at the tarn with Dad, while I continue on with Marko and Amelie. The way up the ridge is easy to find, but not so easy on the legs. 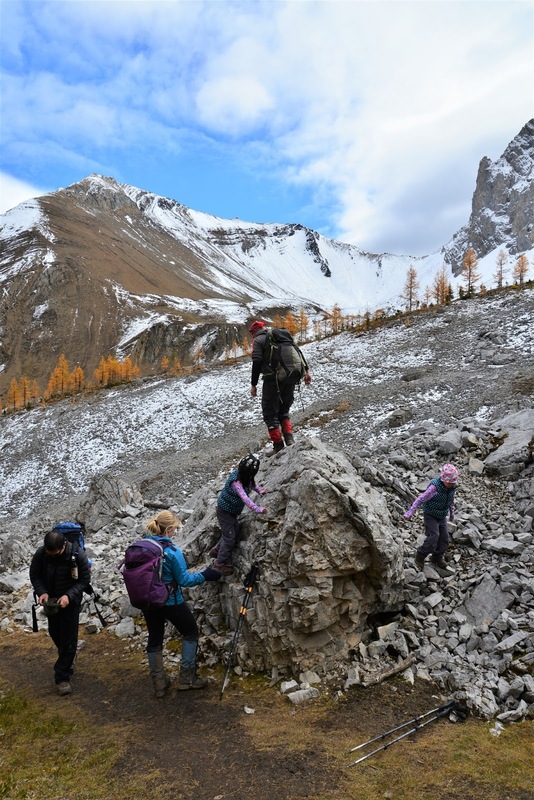 We follow the well beaten path to the top, pausing every now and then to catch our breath. We enjoy the panoramic views from the top and take a few photos before returning the way we came. 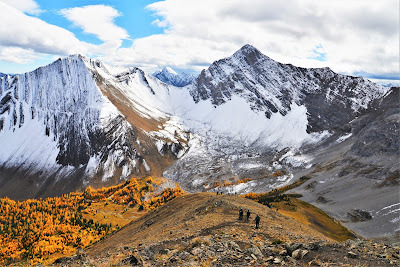 If doing the whole ridge walk, you will hike over 3 more summits (4 in total plus many smaller bumps), before descending to Little Highwood Pass Day Use Area, visible for much of the way down. A creek crossing and bit of route finding are required at the north end of the trail. 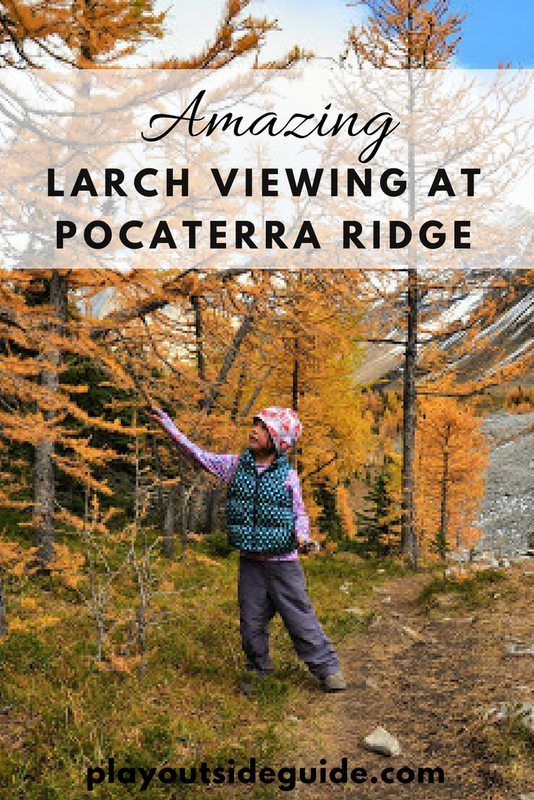 Pocaterra Ridge is a spectacular hike year round, but even better during larch season. To avoid the crowds, go early or midweek! 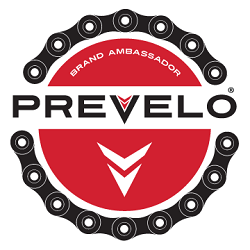 Start at Highwood Pass to save 300 m elevation gain. Cumulative elevation gain is significantly greater than 950 m as you go over several humps, including 4 summits. 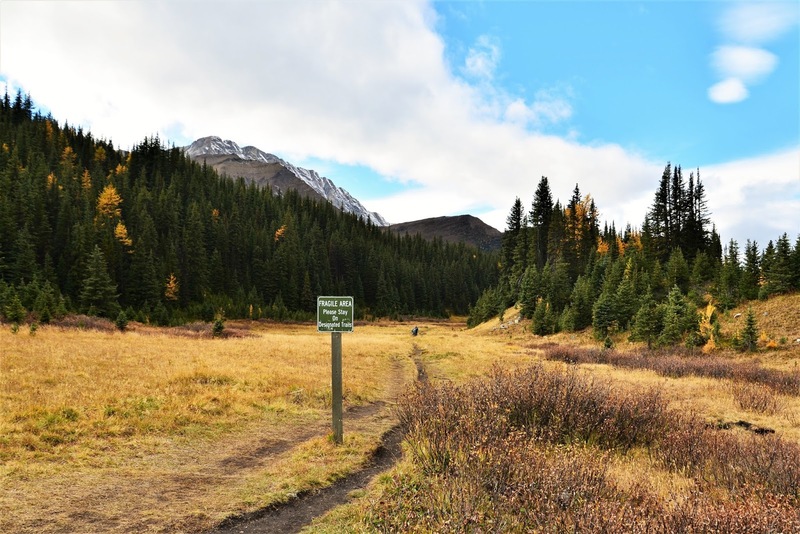 There is a creek crossing and some route finding at the north end of the trail (near Little Highwood Pass). 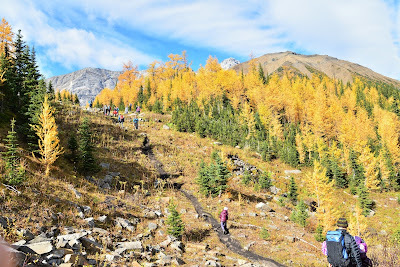 Pocaterra Ridge Trail starts at Highwood Pass 140 km SW of Calgary. Take Highway 1 west out of town to the Kananaskis Trail/Hwy 40 turnoff. Stay on Hwy 40 for 67 km. The marked parking lot - Highwood Pass - will be on your right. 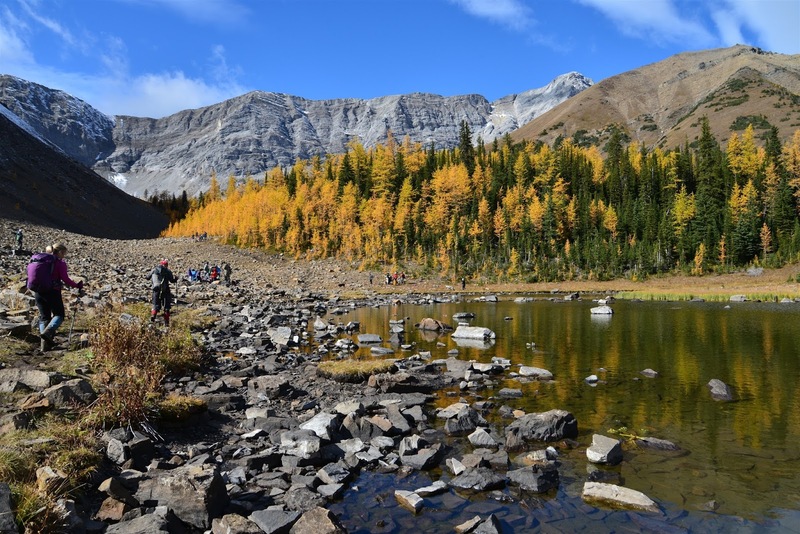 Kananaskis Village (26 km south of Hwy 1) has dining and lodging. Fortress Junction (42 km south of Hwy 1) is your last chance for gas, water, and snacks.